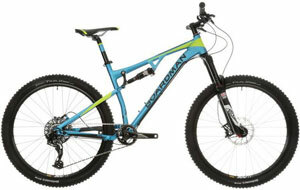 This Boardman Full Suspension 11 Speed Mountain Bike can definitely handle the trails with ease. There are lots of great user comments about the handling and riding experience with this Boardman mountain bike. Many are happy to take this out on tougher terrain and put it to the test. Most then say that it delivers in a way that offers riders confidence. The wheels are large at 27.5’’ and have light aluminium rims and tough Continental tyres. This should all help with that feeling of security and stability. 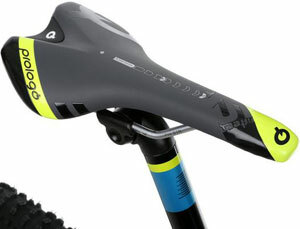 This comfort and security also comes from the RockShox Pike RC 140 mm suspension fork and rear shock absorption. Then there is the handling with the speed and braking for a great performance and fast time. There is an 11 speed SRAM GX gear set. Here the designers promise no cross over or duplication, so users can be sure of a greater speed range than with other bicycles. The brakes are SRAM Guide 4 piston hydraulic disc brakes and are as responsive as most riders would like. The only problem with this Boardman Full Suspension Mountain Bike Pro is that it isn’t the finished article. There are a lot of buyers not quite offering full marks for this bike because of a basic specification. There is nothing major wrong with it, and they have no important complaints about the ride. There are just small details that require fine tuning. This means that some have put in a little more work and money to get the ride they were after. Cheaper elements in the spokes, handlebars, seat posts and some of the padding. Is this Boardman “pro” Mountain Bike still recommendable with this in mind? Many would agree that this full suspension mountain bike is a nice starting point for upgrades. The cheaper elements keep the costs down and allow for personalisation. Users might not get the finished article on arrival, but it is a great starting point. Areas where they certainly didn’t cut corners are the suspension and braking. With a little customisation, users get that brilliant handling, speed and response time, with some added extras. Therefore, this Boardman mountain bike is still recommendable to those that want a project. Find more reviews about the Boardman Full Suspension Mountain Bike Pro on Halfords here.